What is Bun Bo Nam Bo? Bun means noodles. Bo means beef. Nam Bo means from the sphere of the south. So Bun Bo Nam Bo is essentially noddles and beef southern Vietnamese style. Bun Bo Nam Bo is noted on the menu at Bun Bo Nam Bo Hanoi as a salad but that is a rather misleading description. Soup would perhaps be more fitting, but even that misses the mark. Bun Bo Nam Bo is a traditional layered dish that makes beef the hero. The broth in the depths of the deep bowl is made of fish sauce, sugar, lemon and chili and has deliciously light sweet and sour undertones. The sauce is topped with marinated beef, vegetables, noodles and crushed nuts. 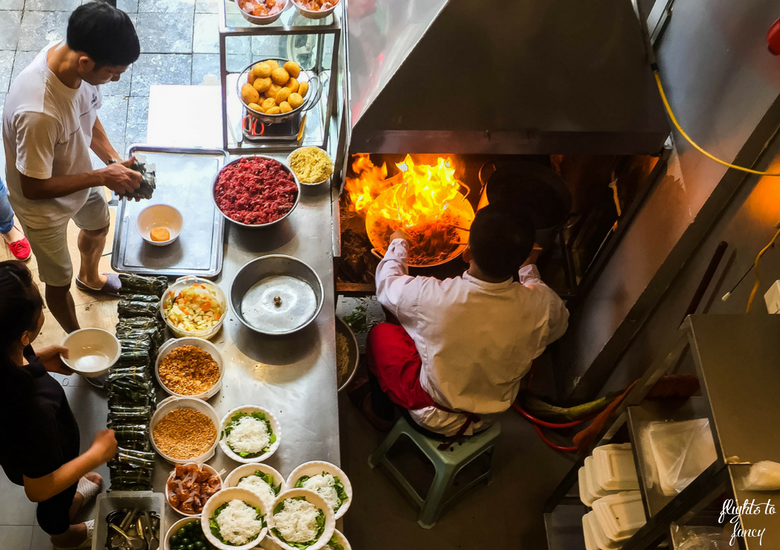 Eating street food in Hanoi is a rite of passage for every visitor. It’s almost the number one ‘must do’ while in town. I’m all about throwing myself into the local culture so I was prepared to give it a go as long as I could appease my ‘don’t eat’ list. 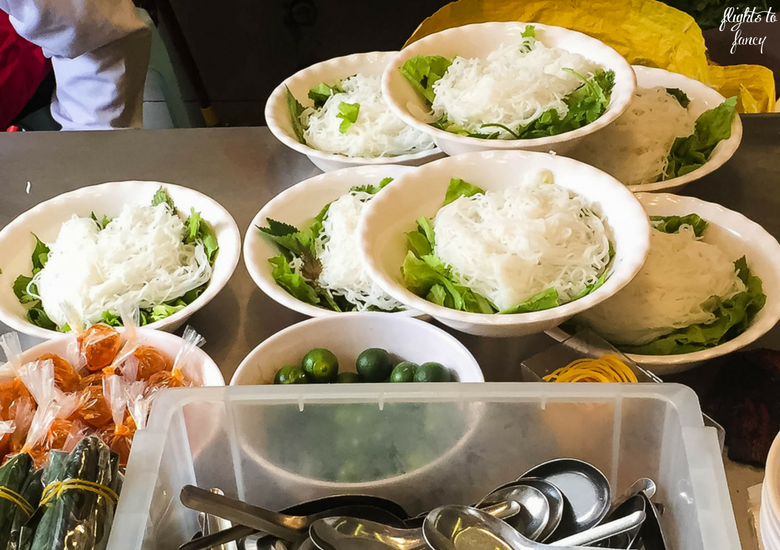 It’s easy to find Vietnamese street food in Hanoi. In every doorway, on every street corner, and down every alley food is being prepared literally on the street. The fancy ones are elevated off the footpath but for many the prep surfaces are literally the ground on which you walk. All around me pots were bubbling, pans were sizzling and meat and veg were being chopped in the midst of daily life in a bustling city. The somewhat dubious hygiene standards made me nervous. Very nervous! Especially since we ran out of time to get the CDC recommended vaccinations for Hepatitis A and Typhoid, both of which can be contracted from contaminated food or water (I know! I know!). But the FOMO was real. How could I miss this quintessential Hanoi experience? I couldn’t, but I did set out to find the best street food in Hanoi that came with the least possible amount of risk. 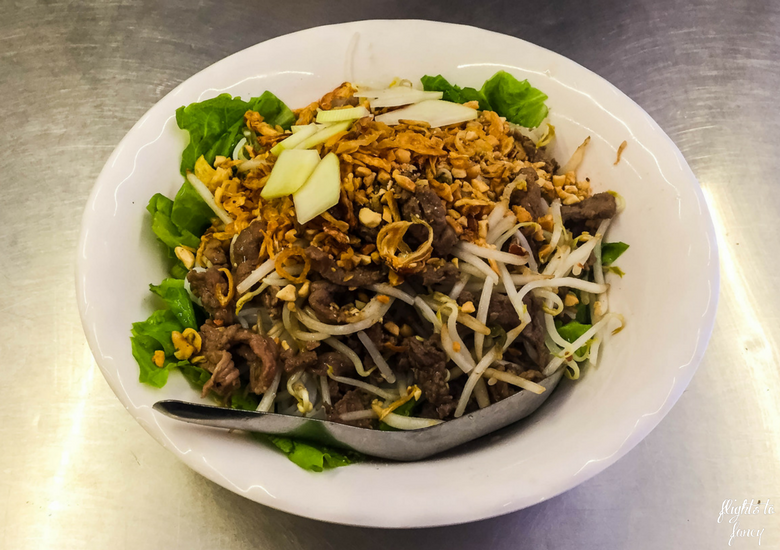 I turned to my trusty friend TripAdvisor and found Bun Bo Nam Bo Hanoi. 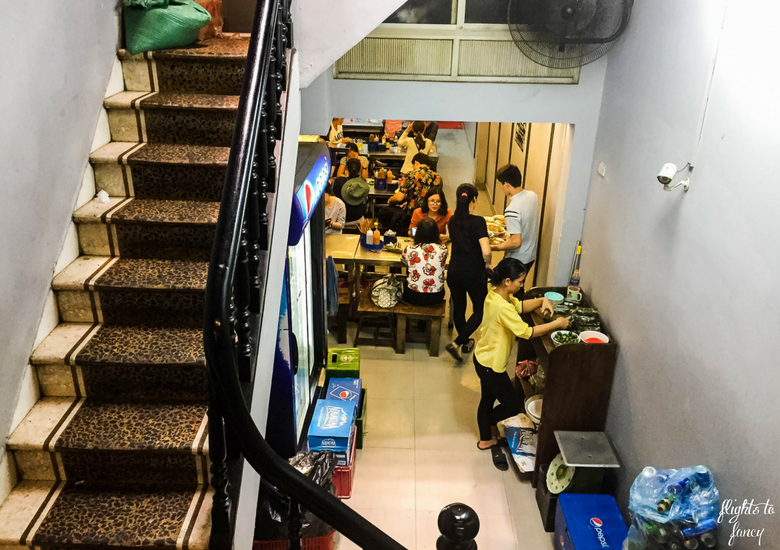 It’s rated 38 Of 1949 Restaurants in town and even features on many of Hanoi’s organised street food tours. With over 2100 reviews and not a single mention of food poisoning (or worse!) I figured it was worth taking a chance. 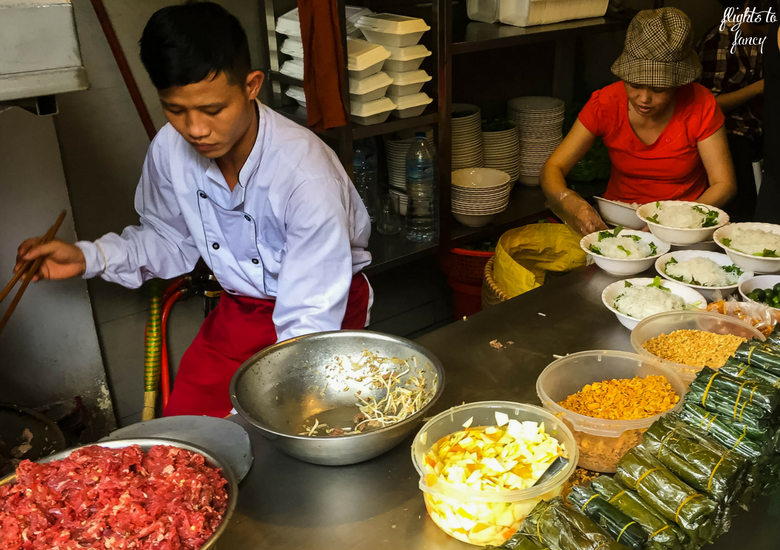 Bun Bo Nam Bo Hanoi is authentic street food without pulling up a tiny plastic stool in the gutter and watching your food being prepped on the footpath. Situated on busy Hang Dieu St, it was just minutes away from where we stayed at the Hanoi Glance Hotel. On approach, all you can see from the unassuming street front is the kitchen. The compact space consists of two burners and a stainless steel bench. There is only room for one and the servers help prepare the dishes from the corridor that leads to the seating area. Well you know what they say about too many cooks spoiling the broth … sorry couldn’t resist! It makes for a rather chaotic arrival and the entry was jammed. We peeked over the crush and were disappointed to see the handful of seats at the communal tables were already full. We were tossing up a take away when the cook pointed at us and said simply ‘upstairs’ while simultaneously summoning someone to show us the way. Once inside we were lead to the last two vacant seats right at the front. Watch your head going up the stairs. The ceiling is incredibly low and The Hubs took a hefty whack to the forehead much to the amusement of our server. Even I had to duck and I’m only 163cms! We couldn’t have asked for a better table. We had the perfect view of the very active kitchen below and we wasted no time ordering a couple of coldies. I’m not normally a beer fan but the choices were limited so I went with the flow. Checking the menu doesn’t take long. 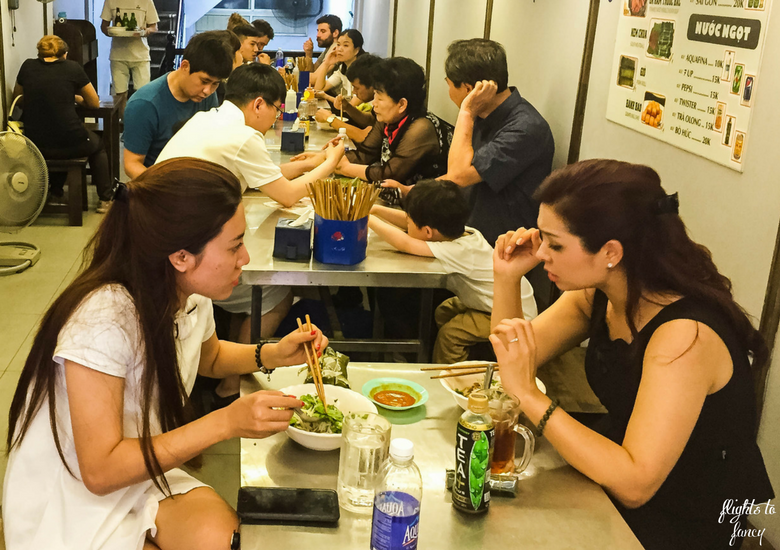 There are only five food items on offer which is typical of the tight menus for Vietnamese street food outlets. Take your pick of Bun Bo Nam Bo, Ga Ham Thuoc Bac, Nem Chua, Gio and Banh Bao. Handing out the menu is clearly a formality. It is so much of a surety that diners will order the Bum Bo Nam Bo that when our server returned moments later he simply asked how many. The Hubs tried to order his without cilantro (coriander) but the look of confusion on our servers face made him abandon any attempts to customise the dish and we simply said ‘two please’. We really should have heeded these tips to getting over the language barrier. I settled into watching a never ending stream of piping hot bowls being prepared below as we waited for our lunch. Within minutes two steaming bowls were placed in front of us. The Hubs wasted no time in stirring all the ingredients through to enjoy his soup style whereas I held back and ate each element off the top with just the smallest bit of broth in each spoonful. It was absolutely delicious. The beef was melt in the mouth tender, the noodles were perfectly cooked and the nuts added the perfect crunch. The serving size was substantial and we couldn’t get through it all. 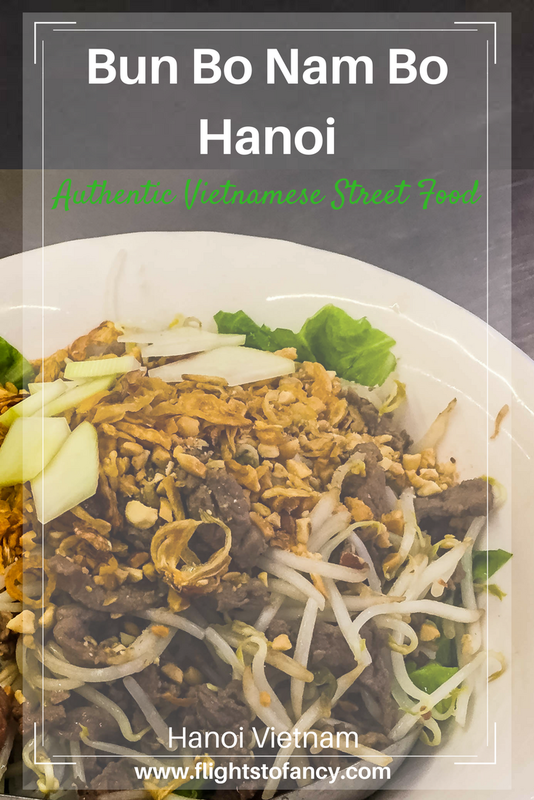 I was truly convinced we had found the best street food in Hanoi. We were intrigued by the one dessert on the menu and decided to give the Banh Bao a whirl for only VND5,000. 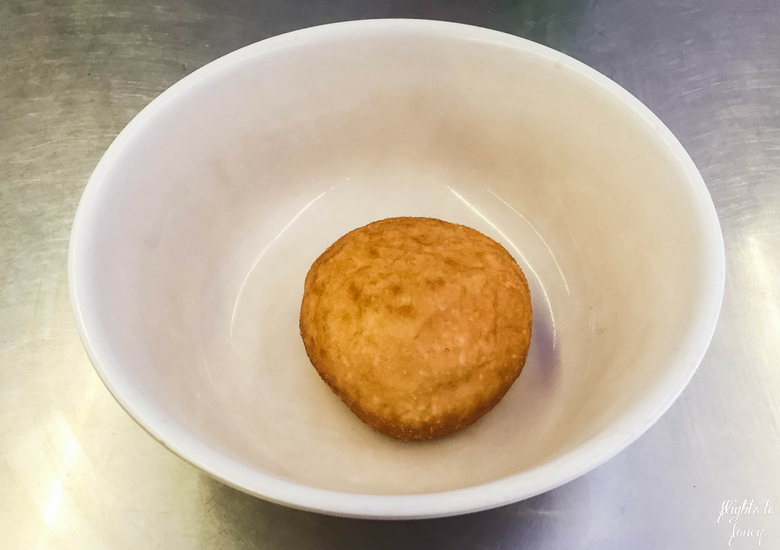 It’s described as a dumpling cake but it has a doughnut like texture that was a let down after our fabulous lunch so we left the majority on the plate. The bill was just $20 in total for two mains, two beers and a dessert the share. If you want to try Vietnamese street food with less risk, Bun Bo Nam Bo Hanoi might be perfect for you. While there are no guarantees, I came out unscathed and thousands of Trip Advisor reviews can’t be all wrong. Having fared so well with my first dabble with Vietnamese street food I was bolstered to try Pi Banh Mi in Hoi An and it was also fabulous. Disclaimer: This post is not sponsored. I paid for my meal at Bun Bo Nam Bo Hanoi in full. As always, all opinions are my own. This post contains some affiliate links which will earn me a few cents to contribute to the running of this site if you make a qualifying purchase at no extra cost to you. You really have a talent for describing food in an enticing way! I visited Vietnam a few years ago and absolutely LOVED all the Vietnamese food. It was so good. My personal favorite was pho. You are making me want to go back for more food! I actually preferred Bun Bo Nam Bo to Pho but that’s just me! The Banh Mi was also sensational in Vietnam. Yum! I have not yet tried street food in Hanoi, but you make me want to go there! I do eat from the streets in many other places in the world though, and I can offer the advice of just go for it. I eat from street stalls all the time in Indonesia and I am seldom sick from it. I expect that after an initial warm-up, your digestive system gets used to many of the bugs. I am going to eat beef noodles today here in tribute to you! I have done the street stalls in Thailand and lived to tell the tale. Bun Bo Nam Bo was next level though. Loved it! That is so good that inspite of so many food restrictions you got your choice food. I too have read so much about Hanoi being a good street food destination. And your pics have driven me crazy with hunger. The dessert turning out not so good is indeed a disappointment. I like how they neatly wrap up food in leaves, looks like they avoid plastic. Hanoi has the best food! 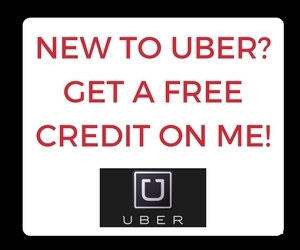 Hope you get to try it soon! I don’t think I have ever been this hungry, your food looks amazing! I would most definitely bang my head on those stairs if I went there, especially since you’re only 163cm! That’s an insanely cheap meal for what you guys got, I would love to give it a try! It’s super cool to see the backend of the tiny kitchen where they are preparing all of the food too! I too have food needs which means it is hard for me to find foods and sometimes makes me feel like I am really missing out on trying street food. Bun Bo Nam Bo in Hanoi looks like a perfect place to have some traditional food whether it is a salad or a soup 🙂 It has been a long time since I was in Vietnam but I would love to return soon and visit more of this beautiful country. 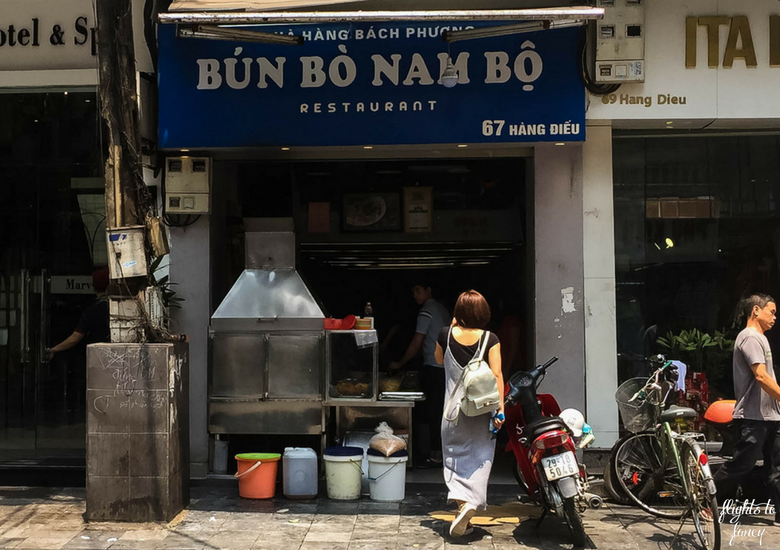 Hanoi would be top of my list to visit as I did love it there so I would drop in and try the Bun Bo Nam Bo and a nice beer. 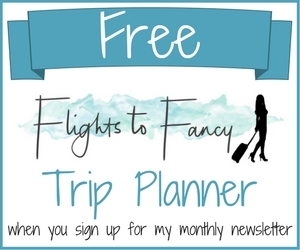 I am going to Hanoi in a couple months and I’d never heard of this! Can’t wait to try bun bo nam bo now! Gonna impress the lady with my knowledge too 😉 Thanks! Hahaha Chris I like your style! Noodle bowl is my all time favorite. Your recommendation also seems tempting. Being vegetarian, I will definitely suggest Bun Bo Nam Bo to my friends in Hanoi. I have been a bit sceptical eating street food abroad because I have had parasites many times. Might be safer in Vietnam though. I havent been there yet, would love to go. I can’t remember last time I had Vietnamese food, they rarely sell any Asian food in Ecuador lol. I love street food and would love to taste all the yummy treats you captured in this post. The photographs truly bring them to life! Hope you get to try it soon Aisha! I’m slightly limited in terms of street food in countries where I can’t communicate effectively in that I’m Muslim, and effectively rendered pescatarian in many countries. 🙂 But I did have Vietnamese food in Saigon because there was a Cham restaurant that we found (Chams being the ethnic group who are commonly Muslim). I looked into doing a street food tour while I was in Vietnam but am embarrassed to admit that I chickened out after seeing stand after stand of fried bugs and being warned about the hygiene issues there. Sounds like Bun Bo Nam Bo would’ve been the place for me. You’ve inspired me to go back and be a bit more adventurous with my food next time! Yeah the fried bugs would have put me off as well Diana! We did a lot of research before picking Bun Bo Nam Bo and so glad we found it! So glad you enjoyed your experience – Vietnam really is all about the street food! It’s great to know that there are options available for people who are a little apprehensive of eating from the street (though I’ve always thought that even though the standards of hygiene might make us westerners uneasy, it’s probably the safest food, because there’s a continually high turn over so nothing’s left sitting out to rot, and everything is always fresh) – Bun Bo Nam Bo Hanoi sounds great! That’s true but I’m still not 100% OK with my veges being chopped on the footpath lol. This was a great alternative for us! I’m really glad that you went ahead and tried the Vietnamese food. I loved every moment that I spent in Vietnam and it was largely due to the food. Though I have to admit after a point of time noodles in everything was getting to me. That’s when the sandwiches were mighty handy! Street food is always a great way to discover the culture of a place. Vietnam looks pretty amazing! It sure was Fiona! I would love to go back ? I love street food! I’m the first one to find a sketchy alleyway and sit on the plastic stool. I’m glad you found somewhere that you were comfortable with though. I’m not that game Nathan but I loved every morsel of food we ate in Vietnam! I have heard so much about Vietnamese street food! Bu Bo Nam Bo sounds delicious. Wonder why they call it a salad? For $20 in total for two mains, two beers and a dessert! Awesome! It was lovely Shruti! I thought it was great value! I would love to visit here. The food looks good. Would love to try some of it. I’m now a big convert to Vietnamese food! I’m not a picky eater (mushroom is one of my faves! even if it’s a fungus!) and Vietnamese cuisine is one of my favorite, second only to Thai cuisine. You’re making me miss Vietnam! Oh I love Thai as well! So much great food in this world! I’d love to go back for another bowl! I might even try to make some at home. It seems you are as picky with food as I am! I wasn’t adventurous enough to try the street food whilst in Hanoi but I now know of this restaurant and what to order. You had a good location, perfect for photographing the kitchen. 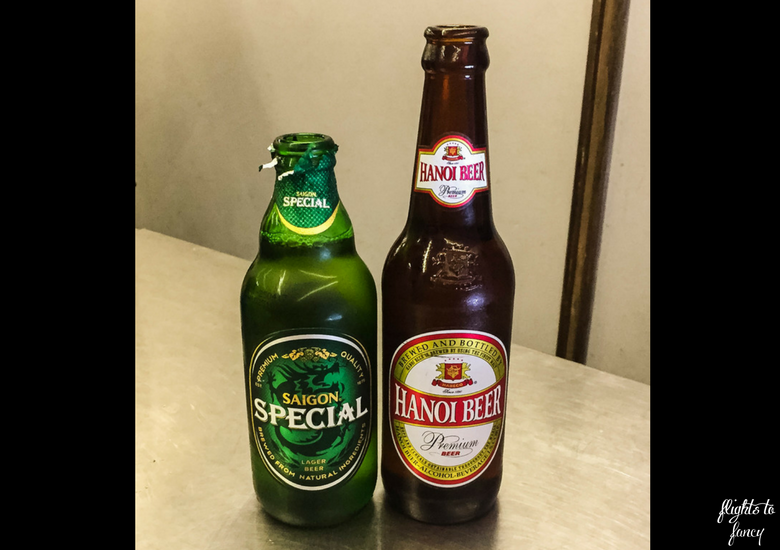 I did try plenty of Hanoi beers when I visited Hanoi though. Some of the street food looked very sketchy and was a step too far for me but this was perfect! I’m drooling just reading this post! I’m Vietnamese but have never heard of this particular dish, so glad I got to learn something new! Was the total price $20 USD? That seems a bit much, I always heard street food in Vietnam was very cheap. AUD Kim. There is definitely cheaper options but I was very happy with the value here. I tend to like the Thai style spring rolls but every country does them slightly differently! The food looks really fresh and full of flavour. Those portion sizes look really substantial too. They were huge! We really could have shared one but if we had I wouldn’t have let The Hubs stir it so probably for the best ? One of my favourite things about Vietnam was the streetfood! It’s amazing what they can make with what would seem like not much to me. It’s so tasty! I agree there’s a lot you can find even if you dont like some foods! So true Sonia. The kitchen was tiny but they made it work and were pumping those bowls out so fast! I’m so glad you got over your food fears and got really stuck in! I pretty much eat anything, but I have to say I am always a bit weary about the first meal in a new place – all this food looks legit awesome though! It ‘don’t eat’ list is usually not an issue as I just order without where needed but that’s hard with a language barrier! I’m not allergic but don’t like the taste so not quite as restrictive as you I am sure. I’ve learned to work the menus in my favour! Of all the cuisines I’ve tried Vietnamese is my all time favorite. We would love to visit Vietnam and try some new things! Interesting to hear about the things you won’t eat. We have a picky eater in our group, too. Glad you find something you enjoyed. It’s my new favourite Natalie! I need to find a great local one to get my fix! I always try local when I travel but I do check it out before I go to make sure I can’t find something to suit my palette. Yes that can be an issue in some parts of Asia and I am always very careful. I actually coped very well Lisa much to my surprise. I loved everything I ate while I was there! It’s good that you braved it Allison! I also have that kind of fear when eating out, especially when it comes to street food. But it would be a shame if you went to Vietnam and not be able to try it. Your plate looks delicious and I am also not the biggest beef fan but i have to say that looks appetizing! Great seat too as you can see the action in the kitchen! It’s hard not to be a little skeptical of street food but sometimes you have to just jump right in! wow when I read begging of that post I feel like I am listening to my husband ! He doesn’t like all those stuff like you, besides sea food, which he wouldn’t try anywhere else but USA ( thats where he’s from) so its not so easy try all those amazing stuff asian countries are offering 😀 We haven’t visit Vietnam yet but I am definitely gonna save this place for when we will go. Hopefully he will eat it 😀 as it looks delicious! Hahaha Ada your hubby would like he has great taste ? I hope you make it to Vietnam and have a great time sampling all the fabulous food. STOP! I’m salivating! I’ve never heard of Bun Bo Nam Bo before – it looks like I imagine the most authentic street food to look, and it’s great to know the taste lives up to the looks. I’m not going to Vietnam any time soon, but I’ll be sure to look this one up back home next time I eat out! I’m planning to hunt some down in Sydney also to see how it compares! I have found that some of the most tasty and authentic food gets served in these small eateries. This place looks like it dishes out some great stuff. Also it is a nice experience to sit and see your food being cooked before it lands on your table. Absolutely Sandy! I always feel more comfortable if I can see the kitchen! Indeed those are legit meals!! If you like this type of food you absolutely have to try Bun Cha!!! Its by far my favourite meal and you can only find the real ones in Hanoi. Enjoy!! Sounds great Joaquim! I also loved the Banh Mi ? That is one thing i cant wait to do when I eventually get to Vietnam, is to try all that food! 🙂 It looks so yummy. Never really done a lot of street food so it seems like Vietnam is the place to do it. We had lost of great meals in Vietnam. Lots more coming to the blog soon! The dessert wasn’t great Neha. There are lots of options for vegetarians in Vietnam, you just have to search them out! I am heading to Vietnam for Christmas and I cannot wait to eat street food. Your selected dish looks delicious, my mouth is watering right now. We recently visited Thailand and Cambodia and we had a lot of street food that was prepared in small stalls without any issue. I will check this restaurant for sure in a few months. 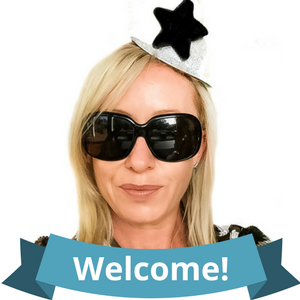 I hope you have a fantastic time Oana! You will have to let me know what you try! For someone who has so many ingredients struck off her diet, you’ve really had some amazing finds! Hahaha I didn’t really I was so fussy until Vietnam. That said I managed to find lots of yummy things to eat ??? I’m always a fan of streetfoods especially the Asian ones. There’s so many interesting flavors and the fact that they prepare a seemingly complicated dish as your soup or salad in a small stall! How interesting is that? I know! It’s amazing what they do with such a small space! That dish looks really good. I would be afraid I wouldn’t want to eat anything there, too. But this looks great! I needn’t have been worried Stacey! I found plenty of yummy foods to try!